Along with the May Fair and the Norman Music Festival, students of OCCC can also celebrate 89er Day at the Moore-Lindsay Historical House Saturday, April 30. Museum curator and OCCC student Angela Gutierrez invites students and faculty alike to the 89er Day Festival that will be held from 11 a.m. to 5 p.m.
Gutierrez said the 89er Day Festival is an interesting way to celebrate the nation’s history. The Moore-Lindsay House will feature live music, art displays, and a variety of food alongside the 89er Day-based exhibit within the museum. Doug Rader, Arabesque, Kyle Giauque, and others will be the musical entertainment for those in attendance, Gutierrez said. Wesley Jackson, education major, thinks the 89er Day Festival will be a great complement to the Norman Music Festival and May Fair. “With all of these events happening at the same time, it makes for a fun and busy weekend in Oklahoma,” Jackson said. To those also attending the May Fair, conveniently located approximately one block away from the museum, free carriage rides will be offered from noon to 3 p.m. as well, Gutierrez said. Admission is free of charge to all visitors and students are encouraged to invite family and friends. 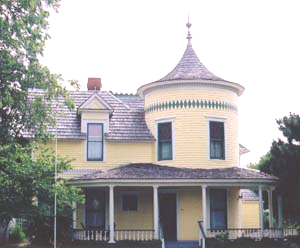 The Moore-Lindsay Historical House is located at 508 N. Peters Ave in Norman. For more information, visit the Moore-Lindsay Historical House website at www.normanhistorichouse.org.